Cold beer is always good but there are several more sophisticated ways to partner this most popular of Asian cuisines, writes Curtis Marsh. 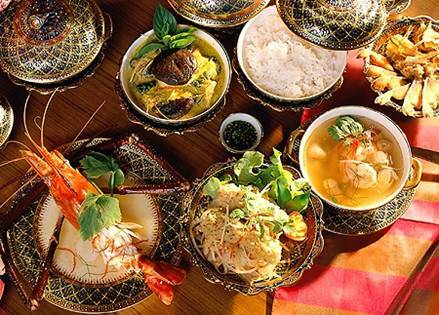 There is a great deal more complexity and flavor in Thai cooking than many other Asian cuisines and, contrary to perception, it can be paired successfully with wine. I can fully relate to an ice-cold beer if you are eating at a stall in the sweltering heat of Bangkok. However, beer does not appease the chilli factor and, as the locals suggest, warm green tea is a better solution to extinguish the fire. Traditional Thai table etiquette is similar to Cantonese with communal sharing of dishes in banquet style; while conducive to good conversation and informality, it does present a challenge for wine to cope with so many different flavors competing with each other at once. The problem can be compounded by a tendency for kitchens in more congenial establishments (usually BYO friendly) to bombard you with dishes in illogical order, irrespective of texture or flavor, with mains sometimes arriving before appetizers. It is prudent to decide on the sequence of the dishes prior to ordering and to convey this clearly and firmly to your waiter. If you are choosing a large number of dishes, group them in to three or four progressive brackets and insist that they are reasonably well staggered, allowing you to experiment with different wines. There are no set rules for matching wine with Thai food; however, aromatic white grape varieties with naturally high acidity work best, cleansing the palate as well as coping with strong flavors, spices and ever-present chilli. Riesling (served well chilled), with its racy, powerful backbone of naturally high acidity, lemon and lime core is the perfect all-rounder for Thai food. It is particularly good with salads, picking up on the principal ingredients such as red shallots, mint, coriander, limejuice and lemongrass. It will also keep up with the spiciest tom yum soup or invigorating green curry and is compatible with stronger meat flavors such as duck or pork. Rieslings that are “off-dry” are hypothetically favorable to chilli, also connecting with the palm sugar used liberally in Thai marinades, sauces and curries. The natural residual sugar in wine is measured in grams per litre (g/l), 2 g/l is bone-dry, above 9 g/l considered off- dry, but realistically, anything above 5 g/l is sitting on the fence. Northern German rieslings are the full monty in this arena with their naturally high residual sugars camouflaged by bracing acidity. Oily textured, low-acid white varieties such as pinot gris, pinot blanc, viognier, gewurztraminer do not work as well with Thai food, but do not take this as verbatim, as there is always room for experimentation with crisper examples. Neither do oak matured whites or those that undergo malo-lactic fermentation, which relegates most chardonnays, with the exception of Chablis, which is predominantly unwooded and with notably flinty acidity from cool and exceptional terroir. Red wine has its limitations with Thai food, the tannins disagreeably accentuated by the sour ingredients and flavors, but there are some beneficial liaisons such as red curries and meats. You will find pinot noir is the most successful red variety to exploit. Its berry-fruit sweetness, soft tannins, silky mouth-feel and a warming spicy farewell achieve a synchronicity with the lurking heat of chilli and spices. I find the juicier, fleshier styles from Australia and New Zealand the most suitable, although I also enjoy experimenting with different Burgundy communes. I would avoid cabernet sauvignon, Bordeaux blends, big Australia shirazs, and Italian reds which have a propensity for firm tannins somewhat lost with Thai food. Disappointingly, Thai cuisine in Hong Kong is unduly relegated to convenience dinning or takeaway food status with an excess of pedestrian restaurants serving up humdrum deep-fried spring rolls and fish cakes, superfluous garnishes of tomato wedges and shaped carrot pieces; any possibility of authenticity lost in translation. There is a serious lack of contemporary Thai food, especially at the mid to upper level, with the exception of Ayuthaiya, operated by the dynamic Aqua group. By comparison, Australian chefs are at the cutting edge of Thai cuisine with acknowledged master David Thompson’s Sailor Thai in Sydney, and Michelin star rated Nahm in London being global benchmarks. Thompson’s book Thai Food (Viking) is an imperative reference for anyone passionate about the cuisine. Chef Martin Boetz and restaurateur Sam Christie at Longrain in Sydney (now also in Melbourne) combine contemporary flair and the best Australian produce to create tantalizing modern Thai and Asian food, with the buzz of an open kitchen and large communal tables encapsulating traditional dining.